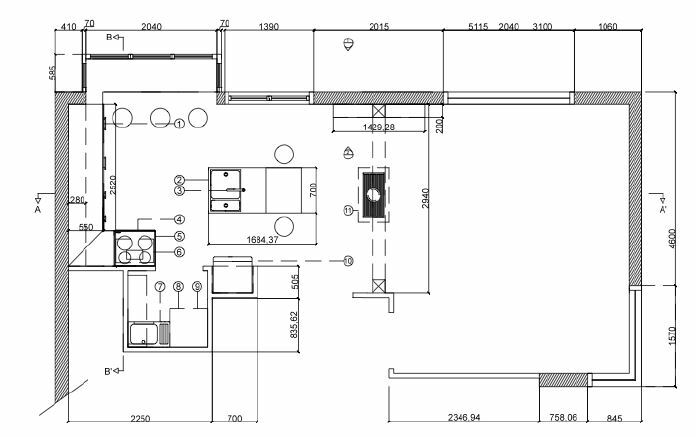 Autocad 2D is often used to create floor-plans and elevations for kitchens and bathrooms. 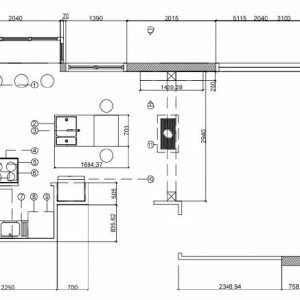 We show you how to quickly and easily create these drawings in our Autocad 2D training courses. A summary of the process is given below. To begin we go the top left Application menu (Mac: File) and choose a metric template. We have covered templates in a previous blog post. Each of the tools and processes below we describe in closer detail in other related blog posts. To check the size of the drawing space type limits into the Command line and hit the Enter > Lower left: 0,0. For the Upper right limit type 10000,6000 > OK. This will give us a drawing space 10m wide. Next we would go into the Layer Properties Manager (type LA > Enter) to create some layers for Walls, Joinery, Appliances, etc, adjusting the line-weights and colours of each. Using the Polyline (PL) or the Line (L) tool, with ORTHO (F8 or Command+L) on, we draw the main shapes of the building foot-print: walls, windows, doors, joinery, etc. The Trim (TR) and Extend (EX) tools are used next to tidy up our line-work. Then we use the Offset (O) tool to create wall thicknesses, shadow lines, beveled edges, Shaker panels, and skirting, etc. We may also use the Fillet (F) tool for curved edges, eg. on a basin or a rounded corner. To create regularly-spaced objects like chairs, lighting, etc, use the Array (AR) tool. And the Copy tool (CP or CO) to copy items to various locations. Blocks are of course used for repeatable items like chairs, tap-ware, handles, etc. Elevations would be created by projecting upwards and across from the floor-plan, in the same way one would do this if drawing paper plans, using the Construction Line tool, perhaps on a non-printing Guides layer. This completes the drawing part of the process – we now create annotations. The Hatch tool (H) is used to shade objects like wall cavities, cross-sections or materials. We then add Dimensions and Text – see other blog posts for how to use these tools. Then we enter the Paper Layouts at the bottom of the screen to scale the drawing for printing. Double-click inside the viewport window to manipulate the view of what’s in Model Space. We then adjust the scale of the drawing on the bottom right pop-up list. Then we double-click outside the viewport window to enter Paper Space. Here we can add title blocks, logos, etc. And edit the text using the Multi-Line Text tool. Lastly we create a PDF via the top left Application menu (Mac: File) and choose Plot then Print. The PDF image opens in a Preview window – if we are happy with this hit Save and choose a location. The resultant PDF should then open in a PDF viewer like Adobe Acrobat or Adobe Reader.